Contact Broward County, Florida Car Accident Lawyers Gerson & Schwartz, P.A. Broward County is in the top 10 counties with the highest pedestrian accident fatalities in the nation. In 2017, Broward County had 1,094 pedestrian accidents of which 62 resulted in death. With pedestrians sharing the roads with hundreds of thousands of cars each day, accidents are inevitable. Pedestrian accidents may also be the result of poor walking conditions on sidewalks, roads, or other walking areas. Accidents involving moving vehicles and pedestrians can be especially serious since the pedestrian has no protective surroundings to absorb the full impact of a crash. Ultimately, the pedestrian’s feels the direct effect of being hit by a moving vehicle. Pedestrian accidents can cause serious injury or death. The Broward pedestrian accident attorneys at Gerson & Schwartz can help. We can answer the questions that you or your loved ones may have. Our clients often ask about receiving medical treatment for serious injuries. These painful and debilitating injuries may also impact your ability to work, resulting in lost wages. If your family has experienced the painful loss of a loved one from a Broward pedestrian accident and needs help, we can answer your questions about a pedestrian wrongful death claim. Contact the Broward pedestrian accident attorneys at Gerson & Schwartz at (305) 371-6000 for a free consultation. 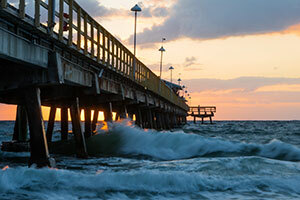 Broward County has over 1.9 million residents and is located on the east coast of Florida. Situated between Palm Beach County and Miami-Dade County, it is easily accessible from I-95, I-595, the Turnpike, US 1, and I-75, as well as from the Fort Lauderdale-Hollywood airport. Cities within Broward County include Fort Lauderdale, Hollywood, Dania Beach, and Pompano Beach. Over 16 million tourists visit Broward County each year. There are hundreds of retail stores, restaurants, hotels, and businesses, as well as several shopping malls, located throughout the county. The sheer volume of residents and visitors results in more cars on the road. Higher traffic creates dangerous conditions for pedestrians crossing the road, walking along sidewalks, and waiting at intersections. Pedestrian accidents may also be the result of dangerous walking conditions. Broken sidewalks, potholes in parking lots and roads, and debris or loose overhangs in construction areas may contribute to accidents for pedestrians. Fort Lauderdale, Pembroke Pines, Hollywood, Margate, Dania Beach, Sunrise, Weston, Coral Springs, Hallandale Beach, Parkland, Southwest Ranches, Pompano Beach, Oakland Park, Lighthouse Point, Plantation, Tamarac, North Lauderdale, Lauderdale Lakes, Miramar, Lauderhill, Davie, Deerfield Beach, Coconut Creek, West Park, Wilton Manors, Lauderdale by the Sea, and Pembroke Park. Traffic accidents involving pedestrians can cause serious injury and even death. At Gerson & Schwartz, our Broward pedestrian accident attorneys can help you through this process. We can answer questions about medical treatment, lost wages, pain and suffering, and mental anguish resulting from your accident that you or your family may have. If your family has experienced the painful loss of a loved one due to a pedestrian accident in Broward, we can help. Contact the Broward pedestrian accident lawyers at Gerson & Schwartz at (305) 371-6000 for your free consultation.